The weather is a changing and we have been blessed with some rains. The winding cracks torn in the earth are beginning to fade and melt together with the much anticipated moisture. We have had unseasonably cooler weather for the past week that somehow sashayed in with the rain. I have lived below the Mason Dixon line long enough to know it is a mirage, the heat wave is waiting in the wings. The dog days of summer are about to break out of the kennel and give us one last parching blast of summer heat. 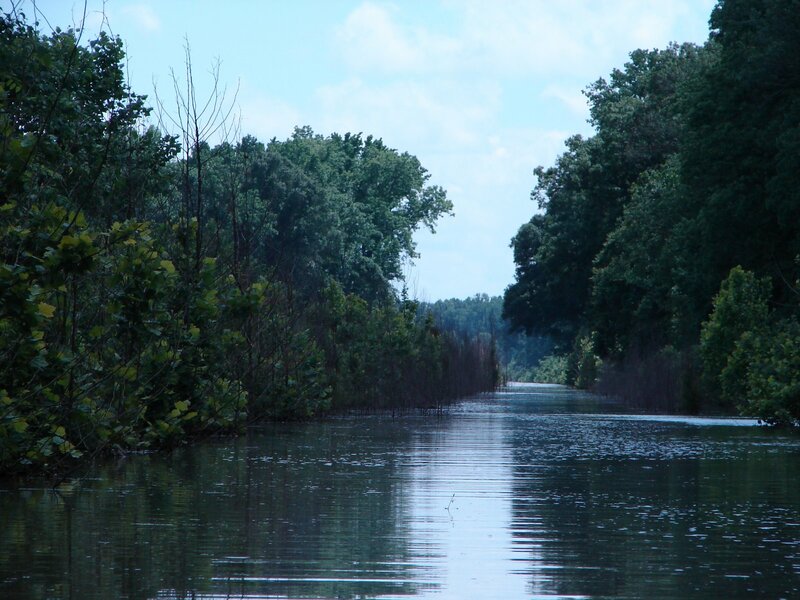 The Big Sunflower River has fallen so much due to the drought, we had to take our boat out of the river, so no more languishing afternoon river rides for us this year. I will throw in a photo of the river for the last of the summer and to open the way for the latest oil painting. This is a work in progress and right now it is in the gestation period, or the time when I back away for a week or two to decide if I believe it is finished. My goal with this painting was to replicate or represent the feeling of fish as they school together in the water. Fish fascinate me and have for along time. I had Koi ponds at my previous house and I loved painting the Koi fish because they were so peaceful and calming. I chose to paint a fish shape rather than a specific fish, as the painting is about the action of fish and the feeling it can give rather than the fish. I believe the dominant principle of design in this painting would be repetition. The repetition occurs in the fish shapes,lines,and in the repeated circles. The lines are repeated not only in paint, but also in the lines of corrugation in the cardboard. The repetition also gives the element of movement to the painting, as well as the element of pattern. 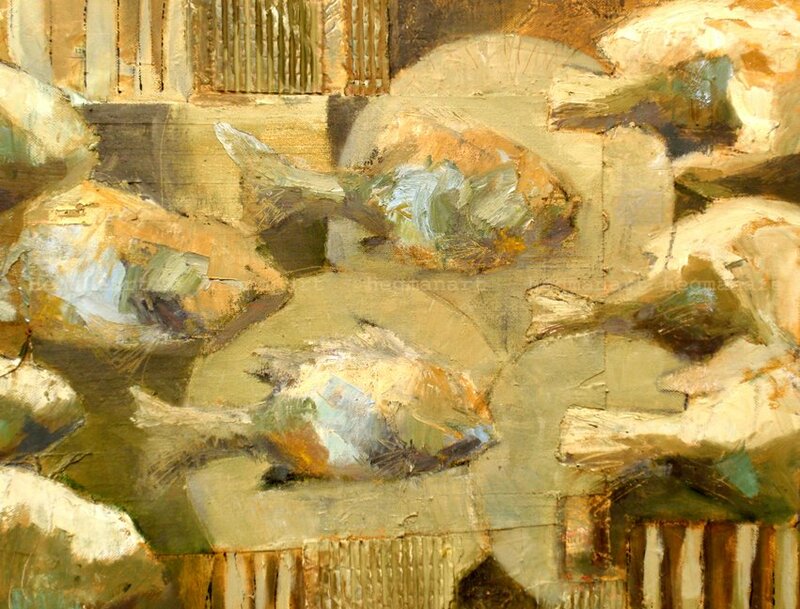 To conceive the calming mood of the painting, my thought process kept going into the thought of schools of fish swimming in unison, and how cathartic that appears, so I chose to use a calming harmonious color palette of earthy, organic hues to achieve this mood. The way that I achieve harmony in my palette is to find one hue (here it was yellow ochre) and to put it in every mixture of paint that I use in the piece, this ensures that the piece will be related throughout. It is often called using a “mother” color in some books on art and design. I even add the mother color into the lights and darks to make sure that I do not lose my continuity of harmony. I added a great deal of texture to the piece both visually and physically by collaging pieces of canvas, cardboard, and string to the surface giving it a dimensional texture. I painted this piece with oil paints, oil crayons and vine charcoal. I will post any further developments on this painting if any occur. The oil paint has served to slow me down in my process and it has given me a new path to travel this summer. The slow pace is nice, but I have to admit to the fact that I painted two acrylic paintings while waiting for the oil paint to dry! Old habits are hard to break and diversity is a good thing! *I would like to add a bit of information about a book of poetry by an artist from Tupelo, Mississippi. She is Patricia Neely-Dorsey and her book is titled “Reflections of a Mississippi Magnolia- A Life In Poems”. I think you would enjoy reading her work and experiencing life in Mississippi through her words. Here is the link to her webpage for more information on the book and Patricia Neely-Dorsey Patricia Neely-Dorsey’s Reflections of a Mississippi Magnolia – Home. All artwork and text included in this blog is copyright protected by Cathy Hegman and should not be reproduced in any form or fashion or used without the written permission of Cathy Hegman. All text and artwork included in this blog are solely the thoughts and original art of the artist, Cathy Hegman, unless otherwise noted, and are meant only to be guidelines and thoughts for others to read.